Feng, Z.; Pearce, L. V.; Xu, X.; Yang, X.; Yang, P.; Blumberg, P. M.; Xie, X.-Q. Structural Insight into Tetrameric hTRPV1 from Homology Modeling, Molecular Docking, Molecular Dynamics Simulation, Virtual Screening and Bioassay Validations. J. Chem. Inf. Model. 2015. Feng, Z.; Ma, S.; Hu, G.; Xie, X.-Q. Allosteric Binding Site and Activation Mechanism of Class C G-Protein Coupled Receptors: Metabotropic Glutamate Receptor Family. AAPS J. 2015, 1-17. Feng, Zhiwei, Stanton Kochanek, David Close, LiRong Wang, Ajay Srinivasan, Abdulrahman A. Almehizia, Prema Iyer, Xiang-Qun Xie, Paul A. Johnston, and Barry Gold. “Design and activity of AP endonuclease-1 inhibitors.” Journal of Chemical Biology (2015): 1-15. Feng, Z., Ma, S., Hu, G., & Xie, X. Q. (2015). Allosteric binding site and activation mechanism of class C G-protein coupled receptors: metabotropic glutamate receptor family. The AAPS journal, 17(3), 737-753. Ji, Kai-Long, Ping Zhang, Xiao-Nian Li, Juan Guo, Hua-Bin Hu, Chun-Fen Xiao, Xiang-Qun Xie, and You-Kai Xu. “Cytotoxic limonoids from Trichilia americana leaves.” Phytochemistry 118 (2015): 61-67. Myint, K. Z., & Xie, X. Q. (2015). Ligand Biological Activity Predictions Using Fingerprint-Based Artificial Neural Networks (FANN-QSAR). In Artificial Neural Networks (pp. 149-164). Springer New York. Teramachi, J.; Silbermann, R.; Yang, P.; Zhao, W.; Mohammad, K. S.; Guo, J.; Anderson, J. L.; Zhou, D.; Feng, R.; Myint, K. Z.; Maertz, N.; Beumer, J. H.; Eiseman, J. L.; Windle, J. J.; Xie, X. Q.; Roodman, G. D.; Kurihara, N., Blocking the ZZ domain of sequestosome1/p62 suppresses myeloma growth and osteoclast formation in vitro and induces dramatic bone formation in myeloma-bearing bones in vivo. Leukemia 2015. Silbermann, R., Zhou, D., Teramachi, J., Xie, X. Q., Roodman, G. D., & Kurihara, N. (2014). The p62-ZZ Domain Inhibitor XRK3F2 Alters Myeloma-Induced Suppression of Osteoblast Differentiation and Is Highly Cytotoxic to Myeloma Cells in Combination with Bortezomib. Blood, 124(21), 2083-2083. Zeng, D., Ouyang, Q., Cai, Z., Xie, X. Q., & Anderson, C. J. (2014). New cross-bridged cyclam derivative CB-TE1K1P, an improved bifunctional chelator for copper radionuclides. Chemical Communications, 50(1), 43-45. Zhang, S., Jia, N., Shao, P., Tong, Q., Xie, X. Q., & Bai, M. (2014). Target-Selective Phototherapy Using a Ligand-Based Photosensitizer for Type 2 Cannabinoid Receptor. Chemistry & biology, 21(3), 338-344. Wang, L., & Xie, X. Q. (2014). Computational target fishing: what should chemogenomics researchers expect for the future of in silico drug design and discovery?. Future medicinal chemistry, 6(3), 247-249. Feng, R., Milcarek, C. A., & Xie, X. Q. (2014). Antagonism of cannabinoid receptor 2 pathway suppresses IL-6-induced immunoglobulin IgM secretion.BMC Pharmacology and Toxicology, 15(1), 30. Feng, Z.; Alqarni, M. H.; Yang, P.; Tong, Q.; Chowdhury, A.; Wang, L.; Xie, X.-Q. Modeling, Molecular Dynamics Simulation and Mutation Validation for Structure of Cannabinoid Receptor 2 Based on Known Crystal Structures of GPCRs. J. Chem. Inf. Model. 2014, 54, 2483-2499. Cheng MH, Bahar I (2015) Molecular Mechanism of Dopamine Transport by Human Dopamine Transporter. Structure 23: 2171-81; PMID: 26106364. Gur M, Zomot E, Cheng MH, Bahar I (2015) Energy landscape of LeuT from molecular simulations. J Chem Phys 143: 243134; PMID: 26723619. Keskin O, Dyson HJ, Bahar I (2015) Biomolecular Systems Interactions, Dynamics, and Allostery. Reflections and New Directions. Biophys J 109: E01-2; PMID: 26377787. Krieger J, Bahar I, Greger IH (2015) Structure, Dynamics, and Allosteric Potential of Ionotropic Glutamate Receptor N-Terminal Domains. Biophys J 109: 1136-48; PMID: 26255587. Dutta A, Krieger J, Lee JY, Garcia-Nafria J, Greger IH, Bahar I (2015) Cooperative Dynamics of Intact AMPA and NMDA Glutamate Receptors: Similarities and Subfamily-Specific Differences. Structure 23; 1692-1704; PMID: 26256538. Haliloglu T, Bahar I (2015) Adaptability of protein structures to enable functional interactions and evolutionary implications. Current Opinion in Structural Biology 35: 17-23; PMID: 26254902. Bahar I, Cheng MH, Lee JY, Kaya C, Zhang S (2015) Structure-Encoded Global Motions and Their Role in Mediating Protein-Substrate Interactions. Biophys J 109: 1101-9; PMID: 26143655. 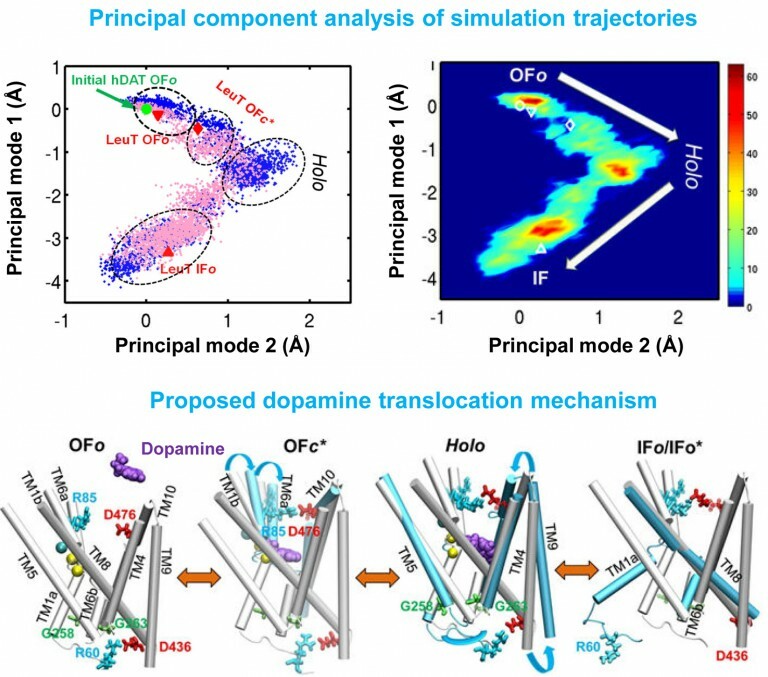 Cheng MH, Block E, Hu F, Cobanoglu MC, Sorkin A, Bahar I (2015) Insights into the modulation of dopamine transporter function by amphetamine, orphenadrine, and cocaine binding; Front Neurol 6: 134; PMID: 26106364. Eyal E, Lum G, Bahar I (2015) The Anisotropic Network Model web server at 2015 (ANM 2.0). Bioinformatics 2015: 1-3; PMID: 25568280. Cheng MH, Bahar I (2014) Complete Mapping of Substrate Translocation Highlights the Role of LeuT N-terminal Segment in Regulating Transport Cycle. PLoS Comput Biol 10: e1003879; PMID: 25299050. Cobanoglu MC, Oltvai ZN, Taylor DL, Bahar I (2014) BalestraWeb: Efficient, online evaluation of drug-target interactions. Bioinformatics 31:131-3; PMID: 25192741. Bahar I (2014) Coupling between Neurotransmitter Translocation and Protonation State of a Titratable Residue during Na(+)-Coupled Transport. Biophys J 106: 2547-8 PMID: 24940770. Bakan A,* Dutta A,* Mao W, Liu Y, Chennubhotla C, Lezon TR, Bahar I (2014) Evol and ProDy for Bridging Protein Sequence Evolution and Structural Dynamics. Bioinformatics 30: 2681-3; PMID: 24849577. Das A, Gur M,* Cheng MH,* Jo S, Bahar I, Roux B (2014) Exploring the conformational transitions of biomolecular systems using a simple two-state anisotropic network model; PLoS Comput Biol 10: e1003521 PMID: 24699246. S. Lee, J. K. Kim, X. Zheng, Q. Ho, G. A. Gibson, and E. P. Xing, On Model Parallelization and Scheduling Strategies for Distributed Machine Learning, Advances in Neural Information Processing Systems 28 (eds. Corinna Cortes and Neil Lawrence), MIT Press, 2014. (NIPS 2014). Wu, W.*, Bleecker, E., Moore, W., Busse, W. W., Jarjour, N., Castro, M., Chung, K. F., Calhoun, W. J., Erzurum, S., Gaston, B., Israel, E., Curran-Everett, D., Wenzel, S. E.* (2014) “Unsupervised phenotyping of Severe Asthma Research Program participants using expanded lung data.” Journal of Allergy and Clinical Immunology 133(5):1280-1288. NIHMS562128. (PMCID: PMC4038417). E. P. Xing, R. Curtis, G. Schoenherr, S. Lee, J. Yin, K. Puniyani, W. Wu, P. Kinnaird, GWAS in a Box: Statistical and Visual Analytics of Structured Associations via GenAMap, PLoS One, Volume 9, Issue 6, e97524, 2014.